AP EAMCET Result 2019: Jawaharlal Nehru Technological University (JNTU), Kakinada on behalf of APSCHE will announce the result of AP EAMCET exam on its official website. Candidates who will qualify this test will get admission in JNTU or its affiliated colleges. Read this article completely to get more information related to AP EAMCET Rank Card. The official authority will release the result online after conducting the exam successfully. Result Date has not been confirmed yet, but it will probably be declared after 1 week of examination. AP EAMCET result releasing date will be the same for each course. Candidates are advised to follow the instructions given below to download the results. Go to the ‘View Results’ option. Enter Registration no and EAMCET Hallticket no. Then click on ‘View Results’ button. 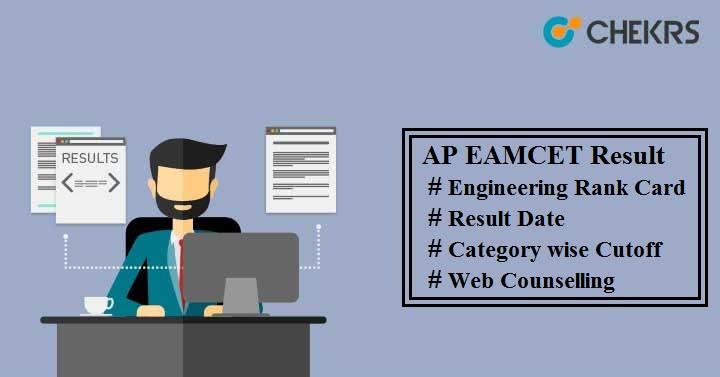 AP EAMCET 2019 Result will be displayed on your device screen. You can follow the same procedure to download the AP EAMCET Rank Card. Just click on ‘Download Rank Card’ and enter the asked details. Just before the result declaration, candidates will be made available with the category wise Cutoff marks. Those candidates who will satisfy the cutoff will be selected to provide admission into various colleges or institution of AP state. It may vary according to the different participating colleges and streams also. On the basis of cutoff, the university will publish the AP EAMCET Merit List for each course separately. It will include the name of qualified candidates according to their rank in increasing order. After checking the Merit List, shortlisted candidates need to check the Counselling schedule and report to the allotted venue with their relevant documents. Counselling Procedure will be held through online i.e. web counselling in 2 phases. If seat remains vacant, then another round can be organized. AP EAMCET Seat Allotment will be done on the basis of applicant’s merit, category, seat availability and choice and preference of candidates. Candidates will have to fill the Counselling form and choose the college & stream of their choice. You can check the official website to know about college wise allotment details, list of students selected in 1st round counselling or 2nd round counselling etc. In case of any other queries just leave your message in the comment box below.